What's important for a site that sells something? Of course, to put what you sell in a striking position. Not to be swamped with graphics, but to allow visitors quick and easy shopping. 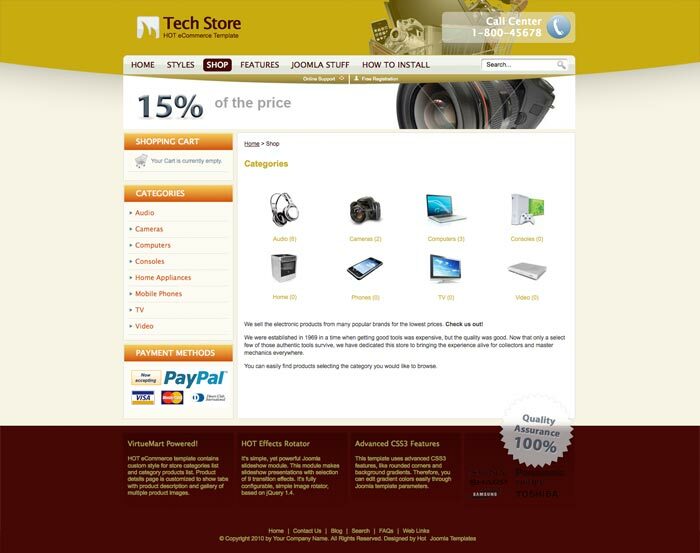 Joomla eCommerce template will help you to create your fully featured online store fast and easily. Joomla eCommerce template - Hot eCommerce can be described as a clean, responsive and fully customizable template. Do you see the gradients under the module names? You can set staring and ending color in template parameters! No image editing! How about the logo? You can change text and color of logo text, also in template parameters! The striking position of the Joomla eCommerce template is reserved for the responsive slideshow module that's equipped with some nice transition effects. You can use it to promote your best selling products or to advertise your new products. We can write a lot of this eCommerce template powered by VirtueMart component. However, it's better to visit our live demo and check it for yourself. We wish you a lot of success and profit with Hot eCommerce! And, as always, a lot of fun! 100% tableless and responsive HTML5/CSS3 template code. Template is responsive in edition for Joomla 3 only. Powered by VirtueMart eCommerce component. 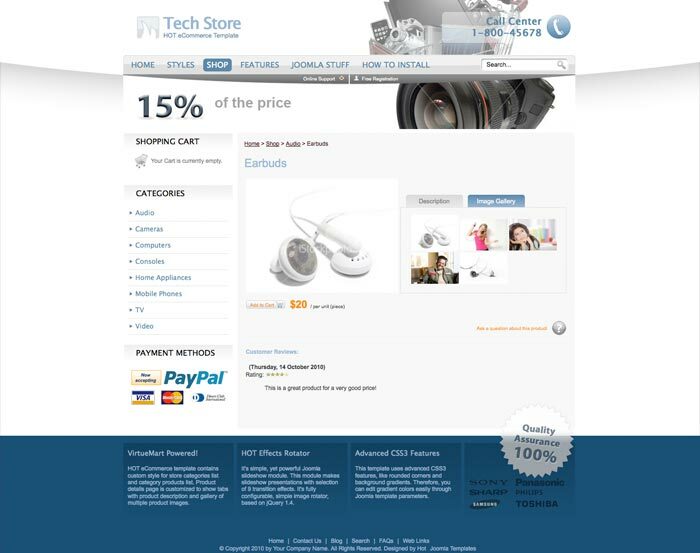 Includes VirtueMart template designed for use with this Joomla template. 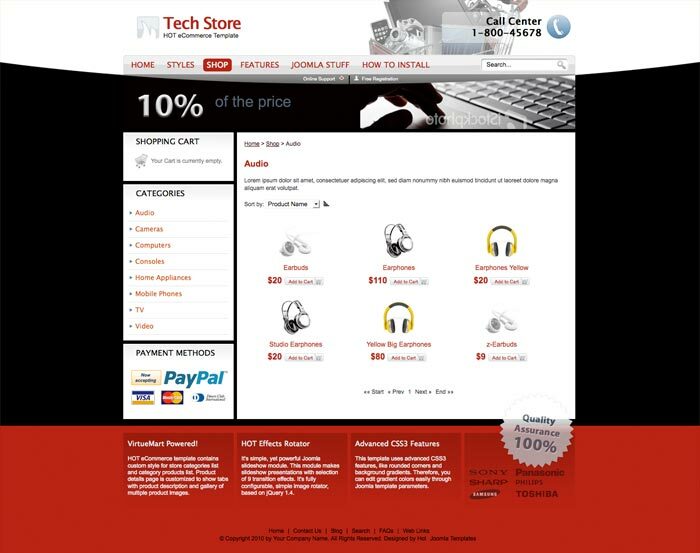 Hot eCommerce template contains custom style for store categories list and category products list. Product details page is customized to show tabs with product description and gallery of multiple product images. VirtueMart products scroller module included and styled for use with this template. Responsive Hot Effects Rotator ($15 value!) 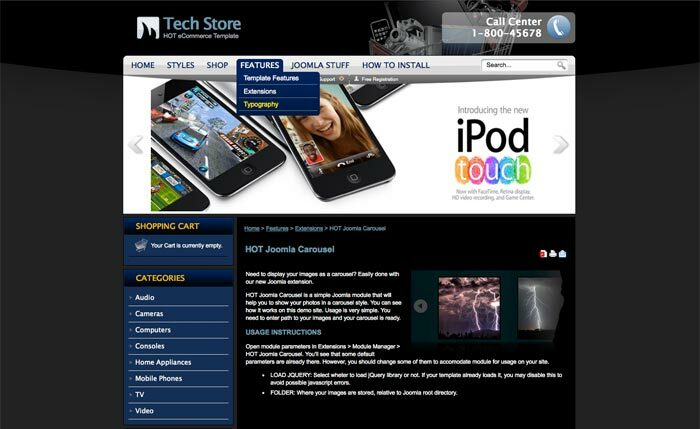 and Hot Joomla Gallery modules are included. HotStart (SQL dump) available with both single purchase or membership plan. It copies demo data easily. You will get your online store out of the box. 27 fully collapsible module positions. Reflection, Back on top and Font Resizer scripts included. Tested with IE7+, Firefox, Chrome, Safari and Opera, on both Windows and Mac. Tested on iOS and Android mobile devices.